Its been awhile and I still haven’t made the decision on my dentist yet. Do you happen to know Dr. Hans Scoble? Why not Dr. Latner? He is one of the best cosmetic dentists in the country. I don’t know Dr. Scoble. I’ve never heard of him. He wanted to do all eight teeth. I just don’t understand that. If I remember right, eight teeth is the right way to do your case. Unless you’re just going to replace the two crowns in the very front. Great cosmetic dentists identify very strongly with the quality of their work, and they don’t want anything ugly out there with their name on it. So I can understand if Dr. Latner doesn’t want to do your case if you want him to confine himself to six teeth. It’s simply not going to look right, and he doesn’t want to be a part of that. I fear you are destined for trouble with your approach. There has to be a little trust between the dentist and the patient or you will not get a beautiful smile. It just doesn’t happen. This is a follow-up to a question from Jamie from California about Fixing a Black Triangle. So I went to a cosmetic dentist your site recommends about my black triangle between the 23 and 24. he said it was small and should not bond it because the gum in that area will be hard to keep clean and could become inflamed and not healthy in the long run. If he doesn’t want to do the bonding, should I go to another dentist? I’d really like to reduce the black triangle. He recommended getting veneers in twos for the space, but I’d really rather not ruin perfectly good healthy teeth for veneers at this point. You’re saying that this black triangle is between teeth #s 23 & 24? Those are the lower right central and lateral incisors. I was thinking you were talking about UPPER teeth. Does this actually show during conversation? Now I need to be careful here, because maybe this space is really ugly, but I’m skeptical. I don’t have a photograph of your face, so I don’t know, and I’m going to need to make some assumptions in answering your question. Having black triangles between lower teeth is not really abnormal, and I wouldn’t be inclined to treat them. Some people have them when they are young, and almost everyone has them as they age. I have them, and I have received numerous compliments about my smile. The lower teeth tend to be covered by your lower lip, and even when they aren’t completely covered, people’s attention is naturally focused on your upper teeth. Have you had other people notice this black triangle? Or is this just something you’re looking at and you have an idea in your mind of how this is supposed to look and how it looks doesn’t measure up to that ideal? I’d suggest getting a friend or two you can trust, and position them at a normal conversational distance, and have a little conversation with them. And ask them if they notice anything unattractive about your smile. Urge them to be honest with you, and hopefully you can trust them to be honest. And make a judgment from that about whether this black triangle needs treating. A good cosmetic dentist addresses the cosmetic needs of the patient as the patient perceives them. But there are limits of reasonableness to this approach. I remember hearing Dr. Ronald Goldstein, who is considered by many to be the father of modern-day cosmetic dentistry, discuss the unreasonable obsession some patients have with the details of the appearance of their teeth. Patients, he said, should evaluate the appearance of their teeth at a conversational distance, and when they use a mirror to evaluate their teeth, should hold the mirror at arm’s length, so that they see themselves as others see them. Then he joked that when they would hold the mirror up close, he would adjust the fee to be inversely proportional to the distance between their face and the mirror. That brought a big laugh from the audience of cosmetic dentists, because they all are familiar with patients who have an inordinate obsession with tiny details in the appearance of their teeth that no one else notices. And the dentist you went to mentioned functional problems with bonding – that you will create an area that will be difficult to clean. Essentially, from what he is saying, he would create a food trap. He is to be commended for his honesty and integrity. But I have a question for you. You said you don’t want to “ruin” perfectly healthy teeth by putting porcelain veneers on them. Why, then, would you want to ruin them by creating gum disease around them? A food trap is far more damaging to the health of your teeth than placing porcelain veneers, and could lead to the eventual loss of those teeth. Getting good dental care is a matter of being able to accurately judge whether you can trust your dentist. It appears to me that this dentist is trustworthy – as a recommended dentist on our list he has to be esthetically sensitive. And he is pouring cold water on your idea, saying that the damage that would be caused by the treatment you want would outweigh any esthetic benefit. You could just trust him, which is what I think you should do, or you could shop around until you find an untrustworthy dentist who will actually do what you want. 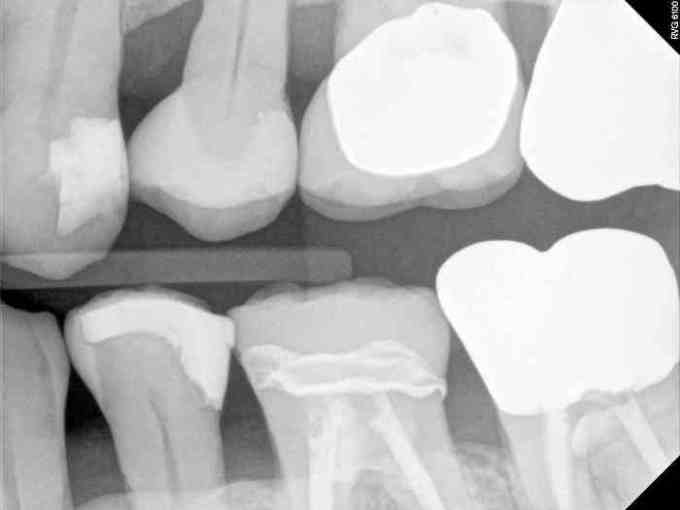 I have a split tooth but the x-ray reveals a healthy root…my doc want to extract and I want him to save it! How do I convince a dentist to try something new like that described in your paper? Dentists seem to want to extract to solve all problems, use scare tactics and it’s hard to believe they are not doing it for the money since much more expense is involved in an extraction and insertion of a new tooth….I want to keep as much of me together as long as I can!!! This is one thing I worry about when I give patients these answers to their dental questions, that they will take this information and go back to their dentist and try to “convince” the dentist of one thing or another, or tell the dentist how to make their cosmetic dentistry more beautiful, or tell the dentist what type of filling or crown they want, different from what the dentist recommends. That will not work. The purpose of this website isn’t to help patients educate or change their dentist. What you need instead is to find a dentist with a philosophy that you are more comfortable with. You aren’t going to convince your dentist to save this split tooth if he has told you that he wants to extract it. It would be misguided of us to even have me personally call your dentist and convince him to save it. I couldn’t do that because I haven’t examined you and for all I know maybe that is the only option here. But there are dentists who are strongly inclined toward saving teeth, and other dentists simply don’t want to do that. And this philosophy permeates their practice at many levels. If a dentist wants to save teeth at all costs, for example, he or she will need to spend focused study on the techniques for saving teeth, dealing with cracks in teeth, what to do for failed root canal treatments, advanced periodontal techniques, and a whole host of things. At the other end of the spectrum, if a dentist just wants to take out problem teeth then they won’t go through all that extra trouble. What point is there, then, trying to convince a dentist to save this tooth when he probably doesn’t even know how? But it is not true that “dentists” in general just want to extract teeth. There is a wide variety of inclinations here. And I firmly believe, from my experience with the dental profession, that the vast majority of dentists are highly ethical people who honestly try to do the best for their patients. They have varying levels of skills and different philosophies. And if you have cause to believe that your dentist is just in this for the money, then you need to find a different dentist. There is no way to work around this trust issue. There is no way, as a patient, that you can check up on your dentist to make sure he is making the right decisions for your teeth. In this situation of yours, even I, as another dental professional, don’t know enough about your case to be able to say if your dentist is doing the right thing or not. You HAVE to be able to trust him. If you don’t, then find another dentist. I switched to a new dentist and during the required new patient evaluation it was recommended that I have a dental crown placed on my upper next to the last tooth. I had no pain in that tooth, but there had been some discoloration there for several years. The dentist did not perform a root canal. I have had continued pain in the tooth since the procedure. When I went back for the permanent crown after 3 weeks, I told my dentist about the pain. He repeated XRays and said everything looked fine. They only temporarily cemented in the tooth since I was still having pain. He said the tooth would probably get better but might take some time. I was unable to get a time estimate but finally was told maybe months. I said I could live with the pain for months if I knew it would eventually go away and that everything was OK. He said it probably would and if not I would need a root canal. This new crown has never felt right to me and still hurts just as much as it ever has. It has been 3 months now and I have had no improvement. The pain is usually mild as long as I don’t aggravate it. I am unable to eat anything on that side at all. The tooth and gum lines hurts if I touch it with my tongue. Last week the gum became inflamed, red, and extremely painful. The pain radiated to my ear. 24 hours later it was much better. It is still red, but not nearly as much. I am not sure I trust my new dentist. I need another expert opinion. I know that this tooth is only temporarily cemented in and I dread having to reaggravate it when the permanent cement is placed. Thank you in advance for your expert advice! You haven’t told me anything that seems out of order, and my guess is that your dentist has done the right thing and you can trust him, at least from what you’ve told me. I myself have had a tooth that has hurt as yours has, and it went on for months while I hoped it wouldn’t need a root canal treatment, but it eventually did. I would go back to the dentist and relate your experiences, and you will probably end up needing a root canal treatment. If your dentist can’t confirm that and is still puzzled, I would ask him for a referral to a root canal specialist, explaining that you don’t want to deal with the tooth pain. The root canal specialist will be in a better position to give an accurate diagnosis in a situation like this.